Hayley Stevens for a few months has been hosting her own podcast apart from "Righteous Indignation" called the "The Ghost Field Guide Podcast." This project is part of her work as a member of Wiltshire Phenomena Research. So far six episodes have been produced and I have listened to three of them: the first, second, and sixth episodes. I know what you might be thinking. Is this some bizarre John Lennon first steps away from the Beatles ala "Two Virgins?" No. First, nobody is naked (sorry Karl), and second, nobody is walling using the most freaky noises late 1960's technology could provide. What Hayley expertly provides is a concise topic per episode on the dos and don'ts of proper skeptical alleged ghost/haunting investigation. The tone of the show is different from Righteous Indignation, which is cheeky, irreverent, while being respectful in a solid English way. Field Guide is Hayley and sometimes a guest discussing a topic for ten to twenty minutes. The show also is not discussing up to the minute topics, but appears to be more geared as a resource that can be relevant in five or ten years as it is today. Stevens is clearly in command of her material, and she is quite comfortable behind the microphone, and the production values are really quite good. Even if you are not planning on doing your own ghost investigation, if you are a fan of or find yourself forced to watch the plethora of ghost hunting shows on various cable channels, this podcast will point out all the errors the investigators are making. Also, many of the basic principles of ghost investigation can be used in other fields. The whole new world conspiracy aspect is actually kinda sad. The conspiracy itself is interesting just for its oddness, but the best part of the episode was Karl and Blake discussing various things Georgian and Southern. The topics range from how everyone is allowed to be armed with a firearm to hamburger joints and Ted Turner. Karl did not edit a lot out, probably only 47 seconds, which worked fine as the podcast was very entertaining. I just hope Karl does not keep his listenership waiting an entire season pondering if he had been struck down with a terrible situation before the next episode. Also, Kylie Sturgess has put out her first "best of the Token Skeptic." Fortunately, this is not a finale to the show as it goes into retire like the Beatles "Hey, Jude" record. There appear to be clear plans for future episodes. It is more like a Best of Saturday Night Live which is designed to having the consumer think "you know maybe I ought to buy the entire season 19 on Amazon." The difference is that the entire back catalog of Token Skeptic is available for free! It is a nice mix of clips with George Hrab, Dr. Richard Wiseman, Dr. Pamela Gay, and a constellation of skeptical stars. I've always wonder how people go about editing a best of episode. Do you take notes at the time? Is it just what you remember as your favorite bits as you toil away on Garage Band? It's a pleasant listen, and it is something more podcasts should look into do from time to time. *I was going to put up a picture of the "Two Virgins" album cover, but this is a PG-13 blog so I will just have the reader Google it. I warn you. 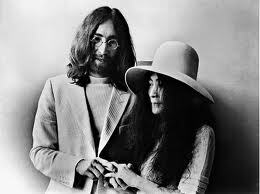 You see John and Yoko's junk. It's not really a good thing. Just want to say: I really like "The Ghost Field Guide Podcast". I stopped listening to "Righteous Indignation" a while back, but for me the Ghost Field Guide is spot on. Those spin-offs are sometimes better than their original podcast. In the same way, I really like the "Token Skeptic Podcast", but don't listen to the "Skeptic Zone" anymore.